Music by Joey Baron and Robyn Schulkowsky. Recorded March 21, 22, 2016, by Adrian von Ripka in Berlin. Mixed and mastered March 23, 24, 2017, by Adrian von Ripka. Cover art: Susann Schaer. Graphic design: Jonas Schoder. Photo: Dariusz Gackowski. Liner notes: Bert Noglik. Executive production by Florian Keller. 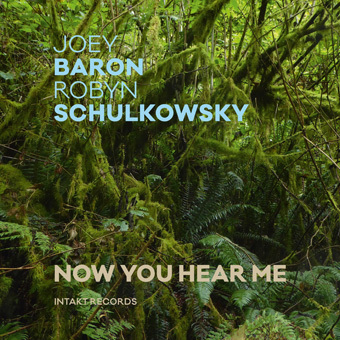 Produced by Joey Baron, Robyn Schulkowsky and Intakt Records, Patrik Landolt. 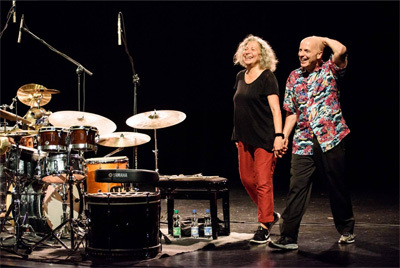 ﻿Robyn Schulkowsky, New Music's high priestess of percussion, and Joey Baron, one of the liveliest and most creative drummers in New York's Downtown scene, come from very different avant-garde traditions. Yet in meshing their talents when they play, categories blur – or rather dissolve. What they bring with them is a kind of oceanic experience. Joey Baron is at home in contemporary jazz. He is one of John Zorn's favorite drummers and can often be heard alongside Bill Frisell; he played with Dizzy Gillespie, Stan Getz, Jim Hall and Carmen McRae; and has also spanned the Atlantic in his recent work with Jakob Bro as well as made a CD in duet with Irène Schweizer on Intakt Records. Robyn Schulkowsky moved from the USA to Europe, where she collaborated on and brought to life the works of New Music's greats. There is hardly a high-ranking avant-garde composer missing from the list: she has worked with Karlheinz Stockhausen, Mauricio Kagel, John Cage, Morton Feldman, Iannis Xenakis, Luciano Berio, Christian Wolff. From the very beginning she was a sound innovator. Now You Hear Me. Invocative, making the presence of a condition felt, appropriating and relinquishing – everyday reality and ritual. Now. Robyn Schulkowksy, eine Perkussionsgöttin der Neuen Musik, und Joey Baron, einer der kreativsten Schlagzeuger der New Yorker Downtown-Szene – die beiden kommen aus unterschiedlichen Traditionen der Avantgarde. Doch sie verschränken ihre Talente. Was sie mitbringen, gleicht ozeanischen Erfahrungen. Iannis Xenakis, Luciano Berio, Christian Wolff. Von Anfang an war sie Klang-Innovatorin, eine Klangschöpferin. Now You Hear Me. Das ist eine Anrufung, die Vergegenwärtigung des Zustandes, Alltagsrealität und Ritual. Jetzt.